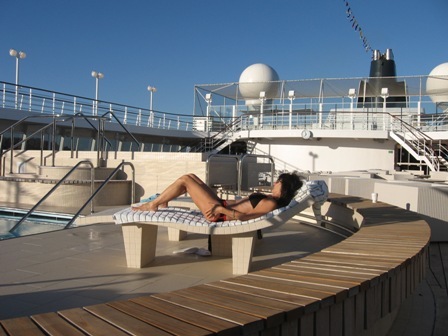 We sailed from Miami to Costa Rica on the spiffed-up Crystal Symphony (pictured here, your Diva on deck)–one of two luxury liners operated by LA-based Crystal Cruises and just about the best in show or seas. Crystal Cruises, a Los Angeles-based global itinerary cruise company redefined luxury when its first ship, the $250 million, 960-passenger Crystal Harmony in 1990 and her sister ship the Symphony in 1995 two of the poshest, mid-sized ships of the time (the Harmony has since been taken out of service). 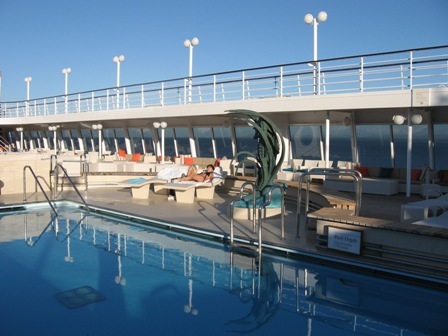 The cruise line continued to impress with the introduction of the super swank Crystal Serenity in 2003– a larger, jauntier version with 1,070 passengers. Back in her day the Harmony ruled the seas with a panache rarely found on a cruise ship. She had style, flair, impeccable service, upscale accommodations, and a remarkable 342 staterooms with verandahs, equaled only by the Crystal Symphony, and later the Crystal Serenity. My husband Richard and I were among the inaugural passengers onboard the Harmony when she made her bow from Vancouver to Alaska. We had sailed on many ships prior to the Harmony but at that time in 1990 few in any proved comparable. We were also on the first cruise of the Symphony from New York to Los Angeles–a three week voyage that actually left us wanting more. In fact we had tickets on a flight from Acapulco to LA just in case we were ready to disembark sooner–but we weren’t. We loved that ship. Which brings us to the present and our most recent return to an even refurbished, reinvented, highly orchestrated Crystal Symphony. 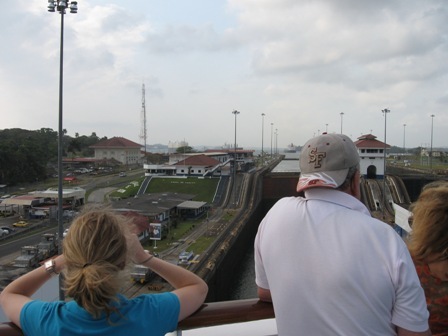 We did 11 sun-soaked days and balmy nights sailing from Miami to Tortola, Antigua, and Aruba and through the Panama Canal to Costa Rica. Refreshed from one of her most recent facelifts (she’s gone through a few since making her bow), the Symphony helps redefines the cruise line once again with its new comfortably chic floating country club/resort hotel styling. We sailed on a Saturday night at 9 PM and spent two days at sea before docking in Tortola in the British Virgin Islands where we booked a ship-run snorkel trip ($50 each) that’s I’d rate about a 7 on a scale of 1-10. Next port Antiqua, where we booked a snorkel and kayak excursion for roughly the same price–which I give a 4 on the same scale. Not enough time in the water, too many hours in a bus with a boring driver who kept stopping to point out meaningless stuff. Hey the Diva has a low threshold for boredom and I was anxious to dive into the water. Also even though food is always readily available on board, we missed the buffet. Then we hit St. Lucia where we just strolled around town, followed by Aruba, an island blessed with silky, white sand beaches and warm, azur-colored seas. We actually took a local us to a beach for $5 roundtrip for both of us, and swam, snorkeled and strolled along the shoreside on our own. The highlight of course was the Canal transit,. Even though we’ve did this dozens of times it never gets old. 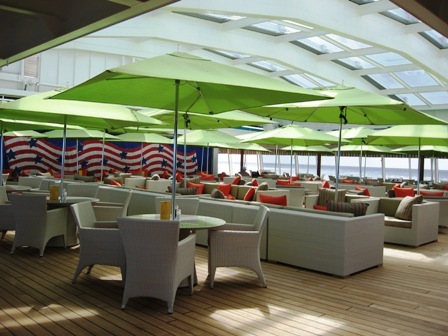 The most noticeable décor differences are around the pool or Lido deck and in the casual Trident/Lido Cafes which have been transformed into a country club-like setting of white wicker furnishings with oversized sofas, colorful throw pillows and the most comfortable lounges and chaises at sea. The long lap-friendly Seahorse pool now boasts an oversize Jacuzzi. The indoor pool is gone replaced by a wicker furnishing where you can enjoy fare from the Trident Bar and Grill. We had the best-placed deck 10 penthouse stateroom, a 365-square foot room that sits a little aft of mid-ship. The Divaontheog grew accustomed to larger staterooms (Silversea and Seabourn) but I size didn’t matter considering we had one of the best butlers (Greg) and stewardesses of all time. All cabins on this ship are acceptable but I do enjoy the privileges that come with a penthouse category like the butler, a mini-bar that is stocked one time free with 3 bottles of wine, a bottle of champagne, two bottles of booze of your choice and unending amounts of beer, soda and bottled water. The king size bed proved almost too comfy. There’s also plenty of storage, a walk-in closed with bathrobes and slippers waiting, a newly redesigned bathroom with much needed and appreciated dual-vanity sinks, Jacuzzi tub, separate shower, Aveda head to toe toiletries and plush Frette towels. Richard and I are seasoned seafarers and travelers and like most of Crystal’s passengers we’ve done dozens upon dozens of cruises (I’ve actually logged over 200 mostly taken for research for cruise guides and articles I’ve written over the years). That said we have a different slant on cruise vacations than most folks. 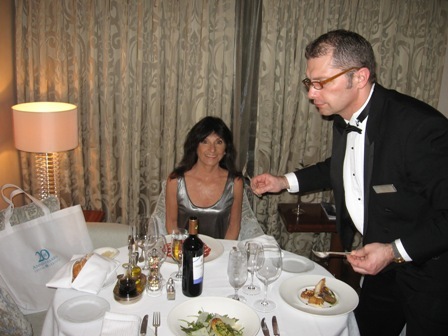 For starters we like to dine in our stateroom often. Which is easy on Crystal (full meals are served on request in all category cabins), and especially enjoyable when you have a butler like Greg who quickly cases you out and is accommodating. The cruise was so smooth and the nights so warm that when we did have dinner in we ate on the balcony where Greg set up gorgeous tables with Frette linens, fine China, glasses and of course our wine. We pretty much like to check out ports on our own and find it often less expensive and more convenient. However we did take two excursions on this voyage (more about them in Part II). We rarely go to shows (although we made exceptions here, more tk), we never take elevators (burn more calories walking), and usually do our own thing. 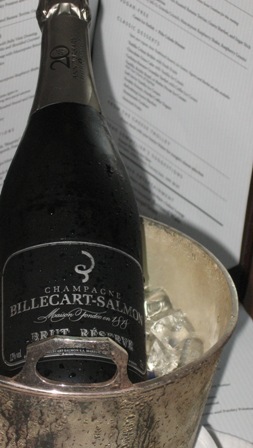 For its 20th anniversary Crystal placed bottles of special reserve Billecart-Salmon champagne in penthouse cabins. Just happens to be one of our favorites which we just managed to enjoy with dinner on the verandah one night. 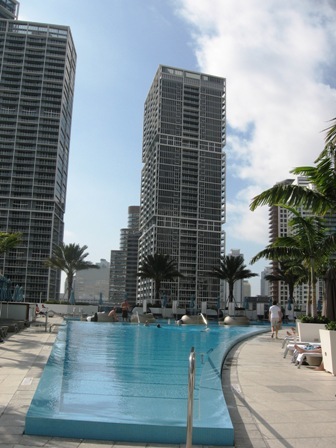 It all began with an uneventful American Airlines’ flight from LA to Miami where we overnighted in the perky EPIC Hotel, a boutique, hip, happening hot spot with great rooms with balconies and views, a good restaurant, top notch fitness center, spa (we didn’t have time to test), large, inviting, saltwater pool and cozy deck, friendly staff, free morning coffee and evening wine and close to the Port of Miami where our ship was waiting (actually less than a $10 cab fare away). Check out the line at www.crystalcruises.com . Also check out: www.savvyseafarer.com and http://bit.ly/2P9nFf for more of my musings about this cruise and other travels. FYI: Crystal Cruises covers the seven seas with a handful of sailing from Los Angeles that this year includes: A February 14 sailing from Miami to Los Angeles, a 17-day cruise from LA to Sydney on Feb. 28; a 19 day Panama Canal voyage from LA on Nov. 2, a 7-day Mexican Riviera sailing on Nov. 21 and a 14-day voyage to Hawaii from LA to Hawaii on Dec. 22.. The cruise line attracts a middle-aged and older, well-heeled, frequent traveler type, mostly loyal, repeat passengers who after sampling Crystal refuse to abandon ship. Fares are in the upper industry range and vary across the board depending on many factors making it difficult to quote. You really need to go to the web site to get an idea: www.crystalcruises.com.